Prowler on the run near Earl Warren, the Golf Course, and residential areas. SBSO, and SBPD are on the scene. Whoa, yes I looked at site, radically inappropriate. ------------------------------------------------------------------------------------------------------ Can you tell me why evangelicals support Trump? Anything to say about his saying/warning that: "he warned, "You're one election away from losing everything that you've got," and said their opponents were "violent people" who would overturn these gains "violently." CBS, NBC and all other news. ------------------------------------------------------------------------------------------------------And that he overturned the Johnson Amendment, which is a lie? "President Donald Trump repeated his debunked claim that he had gotten "rid of" a law forbidding churches and charitable organizations from endorsing political candidates, according to recorded excerpts reviewed by NBC News." ------------------------------------------------------------------------------------------------------ Let's get deleted together. Video cameras on perimeter of homes. A must. Roger, last week didn't you report on that woman in Hope Ranch who notified police of an intruder, as she saw him on her cell phone while she was away from home? They caught the guy as he was crawling out her window in the back of her house. Criminals spend all their time thinking about how to get other peoples' stuff. We potential victims should spend at least a small amount of time thwarting their efforts! He got away the bag they found was an empty old back pack found on the side of road. The K-9 is out and about for anyone who has never been munched by a K-9 they know all the right points to bite. 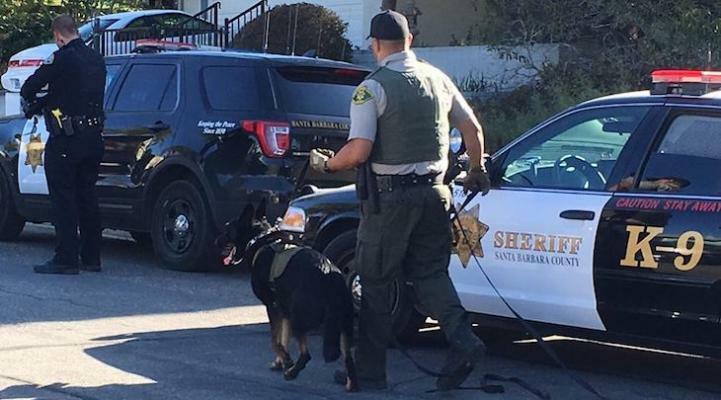 Perimeter set up SBSO K-9 dog coming..
WMA Blue long sleeve shirt, tan shorts, he had a black back pack but dropped it...black hair and facial hair.